All the above modules are supported by a common library that allows the creation of completely arbitrary IPv6 header chains, fragmented or not. Suggested host OS: Linux (*BSD may also work). 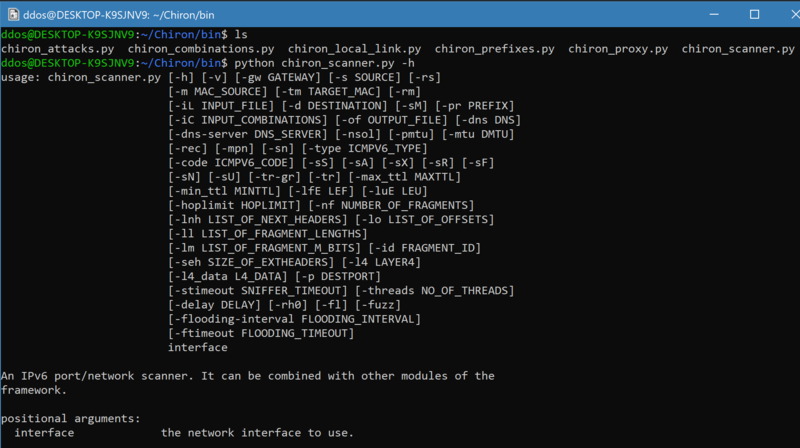 Chiron incorporates its own IPv6 sniffer. It doesn’t use OS stack. • To evade IDS/IPS devices, firewalls, or other security devices. • To fuzz IPv6-capable devices regarding the handling of IPv6 Extension Headers.